A fan laps up Weston “Cro Cro” Rawlins’s performance of Recurring Decimal at the opening of Icons tent, Sanderson Heritage Park, Fyzabad on Friday night. 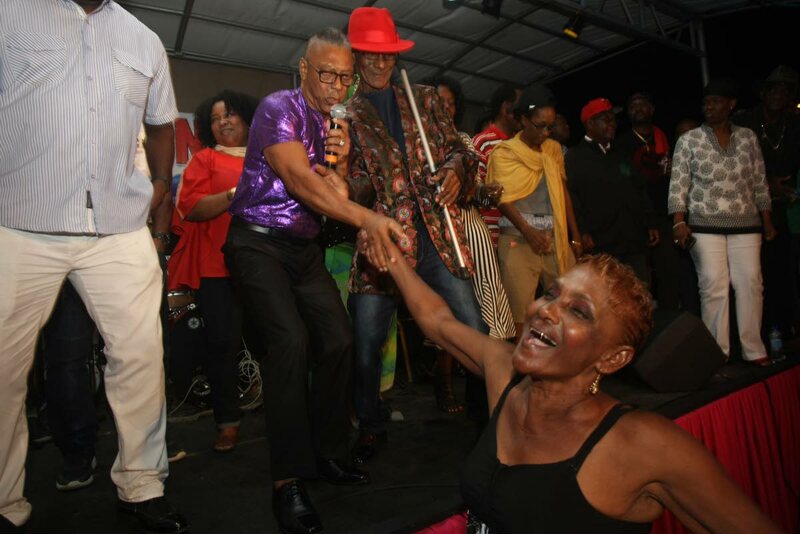 Veteran calypsonian Weston “Cro Cro” Rawlins was unapologetic at the official opening of his Icons Calypso tent as he sang about an incident in which he was recorded using obscene language. A video posted to social media, (which has since gone viral), on January 29 showed Cro Cro shouting and cursing another motorist while he (Cro Cro) was driving in a CEPEP pick-up van. But singing at the tent’s opening at Sanderson Heritage Park, Fyzabad, Cro Cro, who also manages the tent, related his version of what had taken place during the incident in the song Recurring Decimal. Warning: This video contains language which may be offensive to viewers. The crowd, which had dwindled slightly in number after having to endure a 45-minute electricity outage earlier in the night, erupted in laughter and cheers. Several patrons leapt top their feet to sing along with him. Cro Cro was the last performer of the 27-member cast. However, Cro Cro’s composition was not well received by several people on social media including former PP senator Devant Maharaj who posted a clip of his performance on his Facebook page. “Cro Cro sings about the cursing incident and hear the crowd reaction. Imagine Cro Cro heard the driver call him a stupid n***r with his glass up? Shameless display of the lowest example of our culture,” Maharaj wrote. The show, which got underway at just after 8 pm on Friday night, finished at approximately 2 am yesterday. Multiple efforts to contact Cro Cro during the day were unsuccessful. CEPEP chairman Ashton Ford said the incident was being investigated, although he noted preliminary reports showed Cro Cro, a supervisor, was a good employee. The man who reportedly had the exchange with Cro Cro told Newsday earlier in the week that he did not want the calypsonian to lose his job. The Icons tent, which opened for the first time in south Trinidad, comprised both veteran and newcomer artistes such as 80-year-old Durango who sang Survivor – a song about him having outlived such calypsonians as Brigo. Meanwhile, debutant Omari Asson had the mature crowd singing along with him, with several shouting, “kaiso, kaiso” as his song, Ah Just Wondering, told the tale of whether life in the year 2091 would be the same as it is now with rampant crime and corruption. The tent returns to its base of operations at Ambassador Hotel in Maraval. Reply to "Video: Cro Cro crows over cussout"